I am trustworthy and a friend you can rely on. I seek out the truth rather than listening to rumors. If I get something wrong I own-up to it so that I can learn from my mistakes. I show compassion to others. I help people out whenever I can. I don’t jump to conclusions about people’s motives but try to put myself in their shoes and see things from their perspective. I listen to others carefully. If I am worried about someone I pass on my concerns. I make the right decisions. I think about the impact of my actions on those around me. I know the difference between right and wrong. I will say if I believe something isn’t right. I will not be influenced by peer pressure. I give my time up for others. I think about what might make things better for those around me. I recognize the achievements of others and give them praise. I say thank you when people are generous and I try to pass on the goodwill to others. I’m a critical thinker, I plan carefully before I begin, monitor how I’m doing, and I evaluate how I might do it better next time. I am open-minded, brave, willing to take a risk and ready to step out of my comfort zone. I’m hungry for feedback and always use it to help me improve my work further. I show grit and resilience and I keep focussed even when the work is challenging. I do not give up. 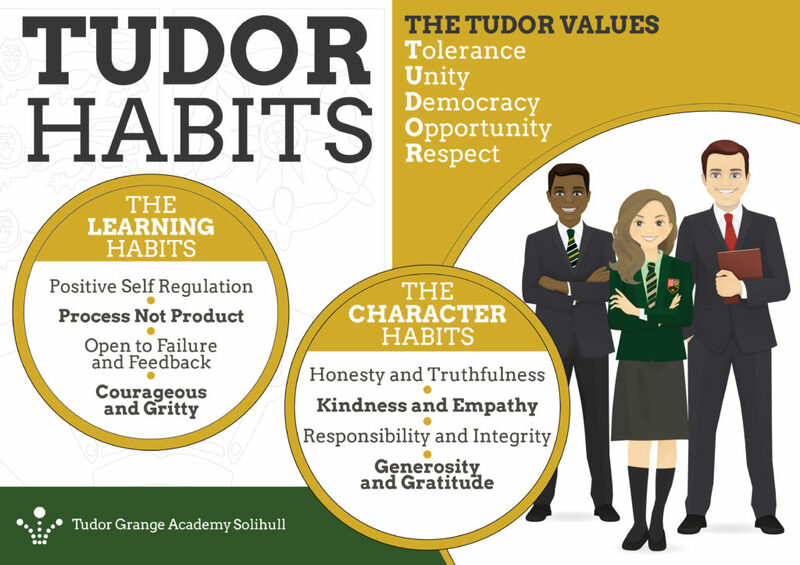 The Tudor Habits play a significant role in our rewards policy. Students who demonstrate the Tudor habits will receive praise stickers in their planners. Students that have a significantly positive impact on the school community are recognised and praised though letters home and regular celebration assemblies. Every half term students will receive feedback on their learning habits through their progress reports (published on parent portal). Students will receive feedback from each of their subjects. They will be assessed against the learning habits criteria outlined above and will receive either: proactive (P) or reactive (R). We believe that students that show a proactive attitude towards their subjects and take ownership of their character and learning are not only more likely to do well in their exams but be better prepared for further education, their careers and their life beyond.